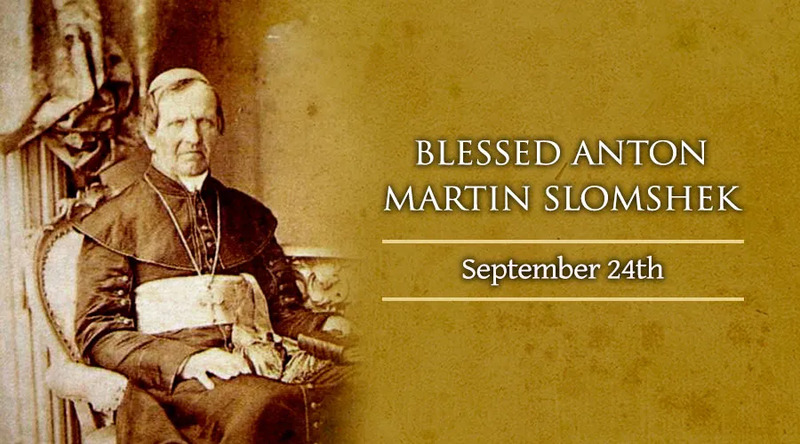 Anton Martin Slomshek who was born November 26, 1800 at Ponikva, Slovenia is the first Slovenian to be beatified. Slomshek is known as a great educator, largely responsible for the nearly 100% literacy rate among Slovenians, a remarkable turn around from the very poor state of the nation's educational levels at the beginning of the nineteenth century. In the late 18th and early 19th century, the Slovenian education system had been crippled by the Austrian empire's suppression of their native language and culture. This left them without their own schools, texts and magazines and newspapers. As bishop, Anton Martin Slomshek reformed the schools in Slovenia, and rebuilt the education system, giving it Catholicism and Slovene history as a foundation. He wrote many textbooks, began a weekly review, and wrote many books and essays concerning whatever questions he considered relevant to the intellectual needs of his people. He founded a society for the spread of Catholic literature, an organization responsible in large part for making possible the rejuvenation of the Catholic cultural base of the Slovenian nation. He was known as a simple and humble man, possessed with a childlike purity, and was loved by his priests and his flock. Blessed Anton once remarked, "When I was born, my mother laid me on a bed of straw, and I desire no better pallet when I die, asking only to be in the state of grace and worthy of salvation." Blessed Anton died September 24, 1862 in Maribor, Slovenia and was beatified September 19, 1999 by Pope John Paul II.